INTRODUCTION: Tissue apposition and fixation is an important component in traditional endoscopic and NOTES procedures. Current devices for endoscopic tissue fixation may migrate through the mucosal lining, may leak, create tissue damage through pressure necrosis, and may not stimulate tissue adhesion over time. There is a need for tissue anchors that safely appose tissues without migration or leakage, tissue necrosis, andcan stimulate tissue adherence over time. 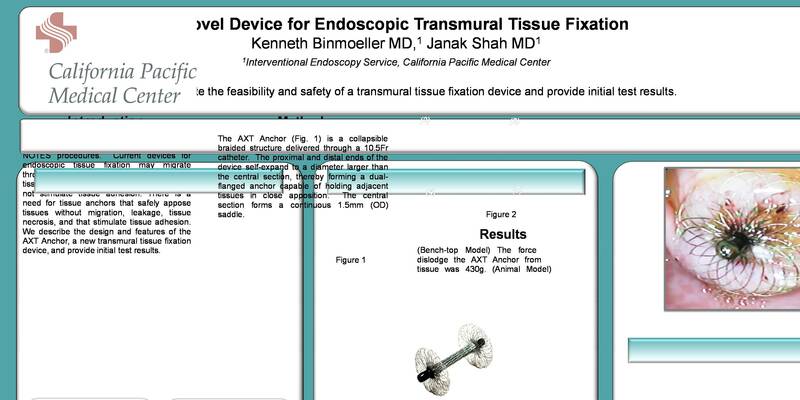 We describe the design and features of the AXT Anchor, a new transmural tissue fixation device, and provide initial test results. METHODS: The AXT Anchor is a collapsible braided structure delivered through a 10.5Fr catheter. The proximal and distal ends of the device self-expand to a diameter larger than the central section, thereby forming a dual-flanged anchor capable of holding adjacent tissues in close apposition. The central section forms a continuous 1.5mm (OD) saddle. The proximal and distal flanges, each 13mm in diameter, hold soft tissue in firm apposition without causing pressure necrosis. Bench-top measurements of the force required to dislodge the AXT Anchor were obtained using an ex-vivo test fixture. Chronic porcine survival studies were also conducted in which an AXT Anchor was placed between the esophagus, right crus, and fundus of 2 survival animals. Tissue reaction in the chronic animals to the AXT Anchor flanges was monitored. RESULTS: (Bench-top Model) The force required to dislodge the AXT Anchor from simulated tissue was 430g. (Animal Model) Anchors were removed from the survival animals at 5 weeks and the animals were sacrificed at either 5 or 7 weeks. All devices were easily removed endoscopically using off-the-shelf tools. All animals were free of infection and showed no behavioral changes for the duration of the study. The AXT Anchor was well-tolerated by the esophageal, stomach, and crus tissues, as verified by weekly endoscopic inspection and gross necropsy. CONCLUSION: This novel tissue anchor is (1) stable and well-tolerated in the GI tract and extra-intestinal structures; (2) holds tissues in close apposition without migration or leakage; (3) does not cause tissue necrosis; and (4) stimulates tissue fusion over time. These characteristics suggest that the AXT Anchor may be a useful device in creating tissue apposition for NOTES and other advanced translumenal procedures.